Northern Voice is finished for another year and we had awesome sessions! 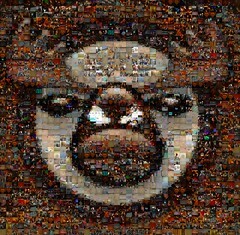 And talented/awesome participants, the moose mosaic was produced by Duane Story from 1600 of the some 2700 Flickr photos taken. It doesn't seem that long ago I was seated at a table with the other organizers in the speaker/session selection process. We had a great batch of submissions to pick from, which is exactly the situation to be in, but with the downside we couldn't accept all the sessions we wanted. There was much discussion around number of tracks, session length, over-all day length. So many trade-offs. This is a great bunch of people to work with and I witnessed one of the smoothest journeys to consensus I have ever seen in a room with more than four people in it (including Darren and Julie with a virtual presence from Malta!). Of course there were bumps along the way. There always is. Hiccups with the web site because of misbehaving software, teething pains with payment gateways, last minute venue details big and small (we did try to get a coat rack this year, honest) and sadly, rubber duck fratricide. Did I mention the organizing committee is a great bunch of people to work with? All these issues and more were handled with grace-under-fire. And then the day of the conference was here. One of this year's new features was the Internet Boot Camp. Exciting! Northern Voice is about the sociology of social media, not technical craft. This is as it should be. But the side effect is after getting people excited about these great tools and methods we often stopped short of telling them how to get started. Cruel! If all you've ever ridden is a horse and suddenly you're given a modern car, it's nice to know some basics about car keys, pedals, and gasoline. And based on the ongoing success of PhotoCamp it's clear our participants like an appropriate presentation of technical craft information. Enter the Boot Camp stream. I'm looking forward to the feedback on this. My impression of the sessions I sat in on is 25 minutes isn't enough time. The sessions were literally just starting to hit their stride when they were over. And there were a lot of unanswered questions in at least two of the sessions I was in. Then came Saturday. I was blown away by the sessions I attended. Matt Mullenweg's keynote was excellent and right on the mark. My favorite Matt quote continues to be, "Spammers are terrorists". The EduBloggers continue to facilitate in academia the kind of class I wish I attended when I did my post-secondary. I'm grateful they come to Northern Voice to share their knowledge and techniques. And two of my worlds finally meet the way they should have a long time ago. The Book to Blog or Blog to Book session was so much fun! Having been a long time attendee of both Northern Voice and the Surrey International Writers' Conference , I've been puzzled at how partitioned the social media and traditional publishing communities are. That's changing, finally. If I have any regrets it's for the stuff I didn't get to for lack of time. There are still lots of cool ideas I want to implement on the Northern Voice website. And Planet Northern Voice didn't get of the ground this year (I was really happy to see Jordan Behan of Strutta step up with the Northern Voice Jaiku channel). And a personal itch didn't get scratched this year, I really wanted to see a PodCamp session following Kris' fine PhotoCamp example, but I didn't get it together myself or convince someone else to do it! And now we're done for another year. Except Northern Voice is growing up and becoming a full blown, Government of BC sanctioned, non-profit, we got a Board of Directors and legal documents type society. Or is that Society with a capital "S"? It's a bittersweet moment, kind of like graduation. Are you a Northern Voice 2008 attendees with feedback? Please share: http://wiki.northernvoice.ca/Northern+Voice+Post-Mortem. Or drop us a message: http://2008.northernvoice.ca/contact. Or blog and tag your post with "Northern Voice" and "NV08". And finally, my personal thanks to our sponsors for their very tangible contribution to making Northern Voice possible: http://2008.northernvoice.ca/sponsors. If there were any glitches, I didn't notice them - the conference was made up of two great days of great content. I totally agree that the Boot Camp sessions were WAY too short. I think some of the presenters could easily have taken an hour. I missed the Planet NV channel (mostly because I'm not 100% sure I like the Jaiku alternative though I am grateful that it's there) but I understand that time was limited and resources spread thin. Kudos to you and the other organizers! It was another successful year and I'm just happy that I like in Vancouver and can attend without having to worry about travel - I'd hate to miss it now that I know how fantastic it is! Ha! I've been waiting to read your take on the conference, Dale. I thought it was FANTASTIC -- am definitely going to attend next year. I learned so much!